This is a topic where I felt many small business owners tend to overlook. While building a website is fairly common, the knowledge of search engine optimization (SEO) totally evades most people. 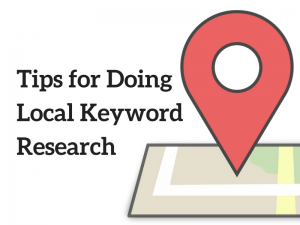 Hence, today’s article is all about going back to the foundation on how to do local keyword research and using that as building blocks to grow a successful business online. Typically, anyone who owns a small to mid-size local business can benefit from this and the main reason is because SEO services can be costly. If you are just starting out and don’t have that kind of budget, picking up these skills on your own is one of the best ways to go. Yes, there are some learning curves involved, but it’s not an impossible task to manage your own company’s SEO. On the other hand, if you are thinking of building a better online presence for business owners, then it’s important to brush up this skill to provide the best service for your clients. Depending on the type of industry and location, your earnings could be anywhere between $100 to $3000 per month. Seeing that many small businesses have yet to go online, the forecast for this niche is expected to be profitable for the next few years to come. Statistics have shown that 1 out of 3 searches on Google is related to local results and that means, there is a growing number of local keywords that can be targeted for a specific business niche. Thus, the purpose of doing research is to find out which of these keywords are most relevant yet easy to rank for so that your business can be discovered online. The more often a business appears on the first page – whether it’s through paid ads or organic listings – the more likely it will attract new and potential paying customers. Without this knowledge, you are merely running an online business blindly and missing out on a ton of opportunities. Before we jump into the process, there are a few things that need to be in place. 1 – First, you’ll need to set up a business website, if you haven’t already done so. Since most local searches derive from mobile devices and there’s a need to provide good user experience, the theme has to be mobile responsive. While Google’s free website builder can cater for that, it lacks proper settings where keywords can be applied like meta title and meta description. Hence, I would recommend using self-hosted WordPress because it usually comes with more space to create content and specific SEO plugins that will allow the proper implementation of keywords. If you’re not familiar with this platform, simply create one for free using the builder below and test it out yourself. 2 – The next thing to do is to create a Google Adwords account so that you can get access to the Google Keyword Planner (GKP). Even though this tool is mainly used for paid campaigns, it can also offer insights about a niche or location specific keywords when expanding your research. 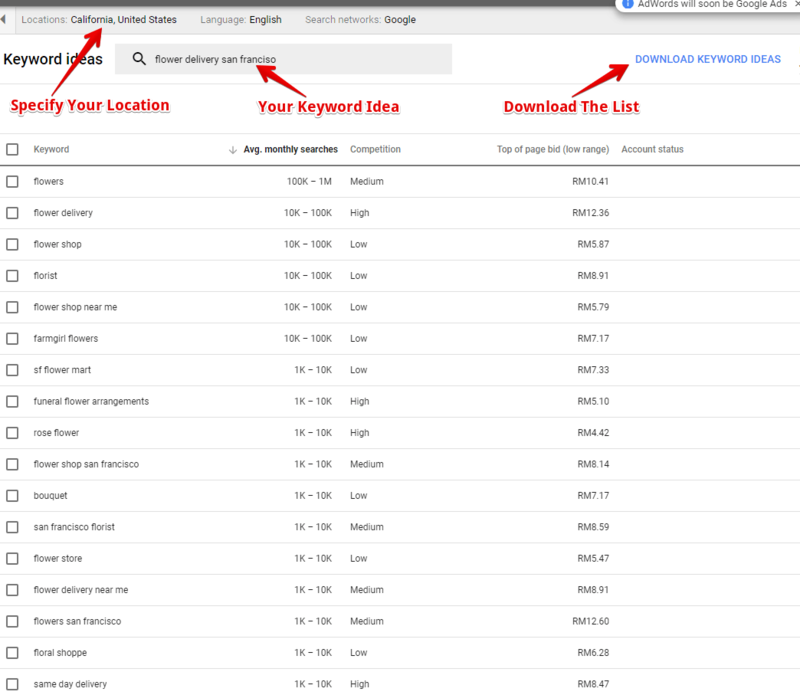 On the Adwords dashboard, go to Tools and Keyword Planner. From there, you should be able to sign in with ease. 3 – The third component which is good to have is a keyword tool that can be used to analyze organic competition. The main reason GKP isn’t a good choice for this is because the competition metric is meant for paid campaigns so this number isn’t relevant for someone who’s trying to rank for SEO. Even the average search volume (AVG) that are so often rounded up into buckets or conflated doesn’t reflect the true nature of this metric. Hence, from SEO point of view, GKP is only great for ideas. In order to get more reliable numbers for SEO analysis, I would recommend using the Jaaxy Keyword Tool which I’ll be showing in the demo shortly. It has a simple interface for data interpretation and also very affordable. If you are not ready to invest in a keyword tool yet, you can actually use it for free (within limited features) when your business website is hosted on this robust online business training platform. Alright, now that we have all the basics in place, let’s go find some awesome local keywords, shall we? Keywords in the marketing sense corresponds to the user’s interest. So when someone searches locally for something, it’s usually because they are interested in buying a particular product or engaging with some services. Hence, the first round of brainstorming is to think about what a prospective customer would type into Google to find your business. Start by thinking about the head keyword first. For example, if you are in the pet grooming niche, your root keywords will be ‘dog grooming’ or ‘pet grooming’. If you are in the bakery niche, the root keywords will be ‘bakeries’ or ‘cake shop’. Since these are local searches, the keywords will also need to have a geo-modifier based on the targeted location such as a city or a suburb. So if you’re living in New York, you might search for dog grooming New York or cake shop New York. However, brainstorming can sometimes be limiting and that’s when you use Google to expand the keyword list. The first technique is to use the Google auto-suggest function. 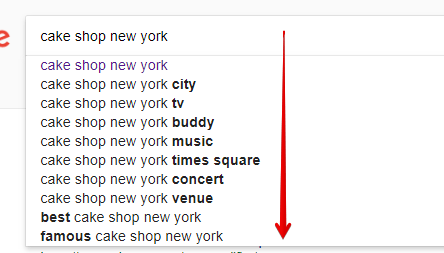 By entering the keyphrase ‘cake shop New York’, Google will also suggest other relevant keywords that are being searched for such as these. At the bottom of the result page, you will find more additional terms related to the original keyword. Of course, not all terms will make sense, so just select the ones with geo-modifiers that are closed related to your business. If you have been running a business website for a while, check with the Google Search Console to see what type of keywords that you could be ranking for. Often times, these are valuable keywords that can be optimized to improve your organic search rankings or utilized for converting ad campaigns. The other technique that can propagate ideas for a keyword is to search using GKP. Inside the dashboard, enter the keyword in the ‘Find Keywords’ column and remember to set the targeted location. For example, while searching for ‘flower delivery San Francisco’, we also discovered other keywords such as ‘rose flower’ and ‘same day delivery’ that we might not have come across using the auto-suggest or search related terms technique. By now, you should have about 5 to 10 geo-location keywords to move onto the next step called the search analysis. So far, we know that some of the shortlisted keywords are trending, but there’s a lack of details such as specific areas whereby the search is populated. This is where you can utilize Google Trends to find out the search interest across a period of time and by the cities. For the term ‘flower delivery’ specifically targeting San Francisco, it’s obvious that the trend is fairly seasonal – peaks can be seen in the month of February and May – and Menlo Park has the most searches online. But how much search volume is enough to justify their popularity with the customers? And more importantly, are those terms easy to rank on the search engines? Practically, you want to target keywords that have good demands and are not dominated by a lot of businesses, aka your competitors. This will give you better chances of showing up on the first page of Google when the keywords are properly optimized on your site. To find out these numbers, we will be using the Jaaxy Keyword Tool. Our cutoff point here is more than 200 for average search volume (AVG) and less than 100 for competition (QSR). Using a flower business as an example, I’ve plugged in 5 keywords that were gathered from the brainstorming methods described earlier. As you can see, two out of five keywords meet the criteria that we wanted. These are the main keywords that are best used on the main pages of a business website. As for the remaining three, they are still potentially good keywords that are best for creating articles such as blogs to help improve one’s organic ranking within that niche. The other benefit of Jaaxy is that, it can be used to spy on your competitors for a particular keyword. For example, if you want to know who are the top ten that are currently ranking for ‘flower delivery San Francisco’, just enter the term into the Search Analysis tab and the tool will reveal their names. For each site, you are able to check on the optimization details such as the meta title, meta description and the number of words that exist on that particular page. The importance of learning this is that you’ll know how to better leverage the keyword on your page, such are creating more content, in order to surpass the ranking of that particular site. Oh, in case you are wondering if this form of spying is legitimate, it is. Many online marketers – be it small business owners or bloggers – do this as part of their research strategy and that’s totally fine. Just like how every business has a goal to achieve, each business website should also have a targeted keyword that they want to rank for a particular location. Not knowing what these keywords are is a huge loss for small businesses to offer their products and services to prospective customers. With more people searching for things online, especially through their mobile phones, keyword opportunities will only continue to grow. Hence, it’s prudent that you learn how to do local keyword research today, so that your business can thrive in the modern marketing landscape. Well, I hope that you have learned a thing or two from this informative article. If you’ve any questions pertaining to this topic, please leave your comment below. Meanwhile, do check out my recommended training platform here to learn more about building a successful online business. Great article! It is very relevant to me as someone starting out in the online marketing world. I think SEO and good keyword research are both great ways to target a niche and give you an idea of the type of quality content you will produce on your site. That way, you can actually get interested audience to look at your products before selling to them. I also started using keyword research tools. So many people are still not aware about how important they are in online businesses or in any kind of website. They aren’t difficult to use either – you just need to know what to look for. I have been using Jaaxy and will certainly try out Google Keyword Planner to expand my choices. Thank you for sharing these tips with us. I have a small website, and having problems attracting traffic, but after reading this, I think I understood where the problem is. When researching for keywords, I tend to aim for high traffic phrases and that isn’t a good idea. Lower traffic ones can actually help to rank much better. Now I have one question, you’ve heard about Jaaxy, right? What do you think about it? Hi Emmanuel, if your website is still fairly new, aim for lower competition (QSR) – not necessarily lower traffic (AVG). I personally use Jaaxy Pro and has been doing so since I started my site. I wanted something that is simple and can show me keyword variations during the research process. As a member of WA, you have access to the tool for free which gives you the basic. For me, that’s good enough and when you start seeing more traffic, consider upgrading to the Pro version for tracking purposes. Interesting read Cathy. I know that most local business owners haven’t got the slightest idea on how to promote their local business online. That’s why most of the times they outsource this stuff to the company that also builds their website. However, with a bit of time and effort they could save themselves a lot of money as it is really not that hard anymore to build a website and do some local SEO, like it is was 20 years ago. Outsourcing can actually be very expensive, especially for new businesses. If every business owner takes the time to learn the bits and pieces, they can definitely promote on their own without the needs to hire for professionals. Well written and informative article. Keywords are very important yes but without the useful information to go with them you wont get far. I had not given much thought about the meta description part until you pointed out the importance. This actually help with a new local site that I am developing. I have bookmarked for future reference so thank you! 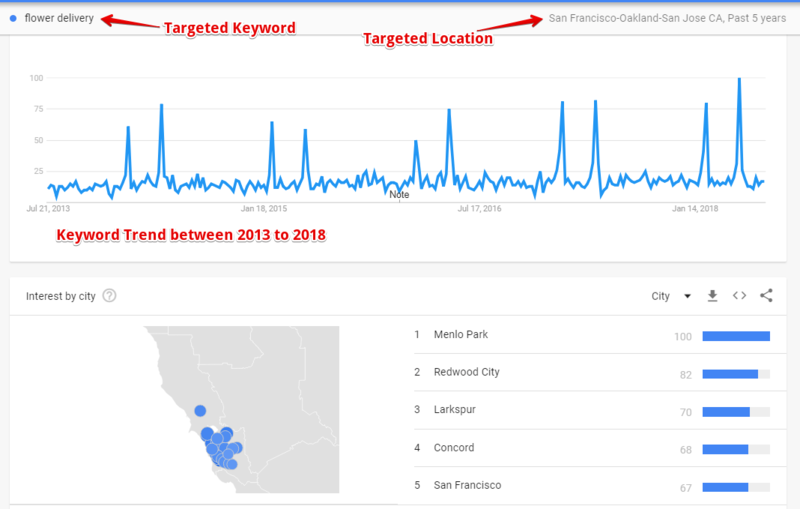 As the Internet becomes more clouded on key search terms like “Flower Delivery California” you have to move more directly into targeting local keywords and Jaaxy is a powerful tool for that. It is easy to use and saves me time floating back and forth to other more expensive SEO tools. When the idea is to rank for your chosen keywords, I would go with Jaaxy every time.